Giving you much more than crystal-clear vision, eyeglasses are enjoying a peak of popularity nowadays. Gone are the days when eyewear was purely functional, and now a wide variety of fashionable designs and modern materials are available. At MyOptix Family Eyecare, you’ll be sure to find perfect pair of eyeglasses to suit your unique style and visual requirements. Our friendly optical staff is knowledgeable about all your options, and we look forward to helping you choose eyewear in our boutique store in Evansville, IN. We stock eyewear from many high profile brands, with quality frames from European and American designers. No matter if your look is sophisticated and elegant or laid-back and artistic, we have plenty of eyeglasses for you to browse through in Evansville, IN. Attractive, modern features include multi-colored inlays, embellishments of decorative crystals and precious stones, and composite materials. In comparison to new plastics and resilient metals in a rainbow of colors, some people prefer rimless styles as a subtler way to wear eyeglasses. 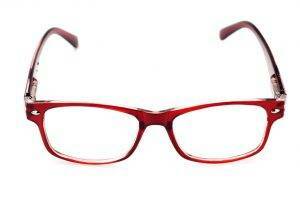 Worn prominently on your face, eyeglasses are the ultimate fashion accessory – why limit yourself to just one pair? We’ll be pleased to assist you in matching your eyewear to different outfits and tasks, from daily wear to special occasions. Our professional opticians are also skilled in advising you on the best shape glasses to enhance your appearance, while also supporting your vision prescription. Polycarbonate is known for being highly durable and able to withstand tough use, as well as offer a superior level of safety protection for your eyes. Polycarbonate is especially useful for active kids, or for adults who engage in sports or extreme activities. Spring hinges and eyeglasses constructed from flexible metal alloys are also break-resistant. If you suffer from skin sensitivities or allergies, it’s worthwhile to consider hypoallergenic materials, such as stainless steel or titanium. Presbyopia is a normal loss of the ability to focus visually on close-up tasks, such as reading. It is strongly associated with aging and generally kicks in after age 40. With presbyopia, your regular, single-vision eyeglass lenses will no longer be effective and you’ll need to start wearing multifocals. However, if you’re able to see sharply without eyeglasses for distance viewing, simple reading glasses may be sufficient for you to put on when reading or doing other close work, such as sewing or crafts. Progressive lenses: highly advantageous for the wearer, progressive lenses give clear vision at a multitude of distances (not just two or three). There are no lines in the lenses either, so they appear more attractive and grant a smoother transition when focusing from one distance to another. Variable focus lenses: an innovative, new lens on the market, these provide a wider field of view than regular bifocals, trifocals and progressives. They can be adjusted efficiently to give the particular lens power needed for a particular job. Aspheric lenses: slimmer, for a more attractive look. These lenses eliminate the “bug-eye” appearance of some prescription eyeglasses. Polycarbonate lenses: ideal for children’s eyeglasses and protective eyewear, they are up to 10 times more impact-resistant than standard plastic lenses. Polycarbonate lenses are also lighter and thinner than average. To learn more about all which options are best for you, contact us at MyOptix Family Eyecare for a consultation. We can’t wait to meet with you in Evansville, IN, to help you choose the ideal eyeglasses so you look and see great! 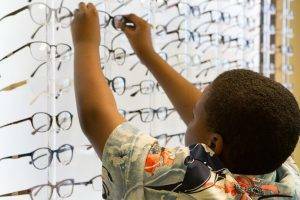 An in-depth look at at the eyeglass lens options, beyond a simple glass or plastic.